The name “Made to Measure” may sound strange at first, especially for someone who is not very into Gucci products. That name actually came from Gucci’s fashion products. There is a line of garment products from Gucci that is named “Made to Measure”, whose products can be individually measured for each buyer. Gucci Made to Measure has come as an haute perfumery quality fragrance to complete the line. Unfortunately, this fragrance is either a hit or a miss, depending on your needs and preferences. Gucci Made to Measure is more of a professional perfume that is more suitable for work and office hours. Below, you can get to know more about Gucci Made to Measure. Continue reading! Gucci Made to Measure is a quite a new fragrance that was released in 2013’s fall. It is said that Gucci Made to Measure has been made for the worldly and refined men who demand the very best. It is almost like an expensive tailor-made suit. Unfortunately, Gucci Made to Measure seems to be trying too hard or perhaps too serious for the professional aura. 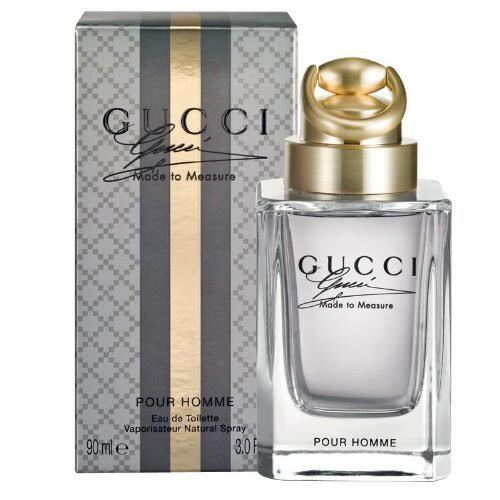 Gucci Made to Measure is available as 30, 50, and 90 ml Eau de Toilette bottles. The packaging and bottle of Gucci Made to Measure truly appear luxurious. If you love to collect classy and elegant perfume bottles, then Gucci Made to Measure is a must-have for your collection. The color scheme of the packaging is the distinctive slate and pearl gray of a suit and shirt button. The box is also adorned with the Gucci’s Diamante pattern, which dates back to the ‘30s and reflects the heritage of the house. Inscribed in jet enamel is the signature of the maker house. The flacon features a hand-brushed and individually finished solid metal cap with an exclusive golden color. Not all people are satisfied by this fragrance. Some people are apparently disappointed with the fragrance because it does not actually stand out. It smells clean and fresh and modern, but there is nothing to impress and to remember. Such unpronounced smell makes this perfume good if you want to smell nice, but don’t want to actually get attention. The scent is more suitable for a professional environment, being clean and such with slight spiciness and crisp. The sillage is somewhere between soft to moderate, as the scent does not project very far. Unlike the typical work fragrances, Gucci Made to Measure is not intoxicating. It is gentle and elegant. The longevity is pretty good, as the scent lasts for a few hours. Check the best price of Gucci Made to Measure here!